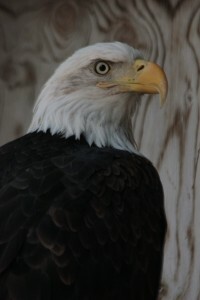 Eetodo: Eetodo is a mature bald eagle that came to us from Oklahoma in 2006. When she was young, she fell out of her nest and a predator took off the first inch of her wingtip. In addition to losing part of her wing, the injury caused feather follicle damage which makes her end primary feathers to grow in backwards. Eetodo gets bored very easily and we are constantly keeping her entertained through the use of toy balls and blocks of ice. Wildman: Wildman is a mature bald eagle that came to us from Nebraska in 2006. Wildman is completely blind in one eye. He got his name from the fact that he enjoys flying, but everyone has to watch out since he cannot see well. He has been known to touch you with his wing on accident when he flies. 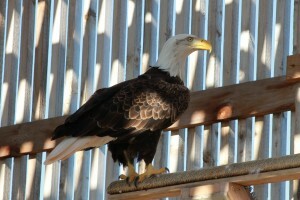 Wildman can be seen in our main flight cage. Vic: Vic is a mature golden eagle that came to us from Colorado in 2006. We do not know how he was injured, but one of his wings has muscle and ligament damage. This damage has caused him to lose his ability to fly. He is very calm and his favorite food is squirrels. Vic can be seen in our golden eagle flight cage. 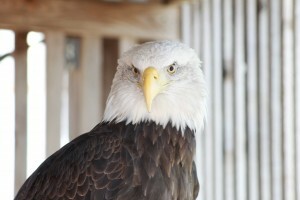 Thega: Thega is a mature bald eagle that came to us from Oklahoma in 2007. Her name means “third daughter.” At some point, Thega flew into an object and broke her wrist. Unfortunately, it did not heal properly so over time her flight ability has been declined. She is one of the quiet females we have at the facility. 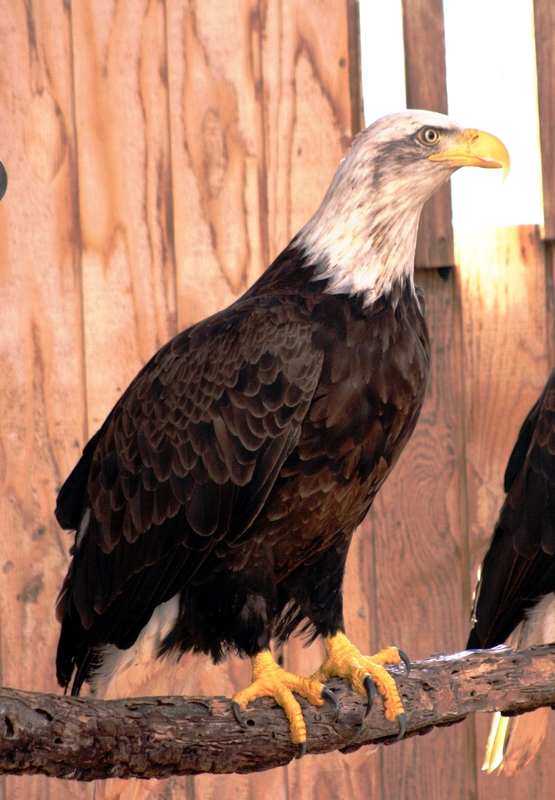 Thega can be seen in our main flight cage. Cinnabar: Cinnabar is a mature golden eagle that came to us from Connecticut in 2007. She flew into an object while flying and broke her wing. By the time someone found her, her wing had already calcified incorrectly. She is a very calm and kind bird. She loves squirrels and will attempt to steal Vic’s if he looks away. 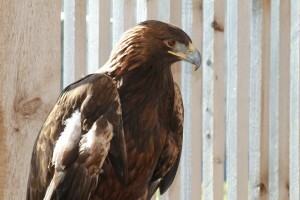 Cinnabar can be seen in our golden eagle flight cage. 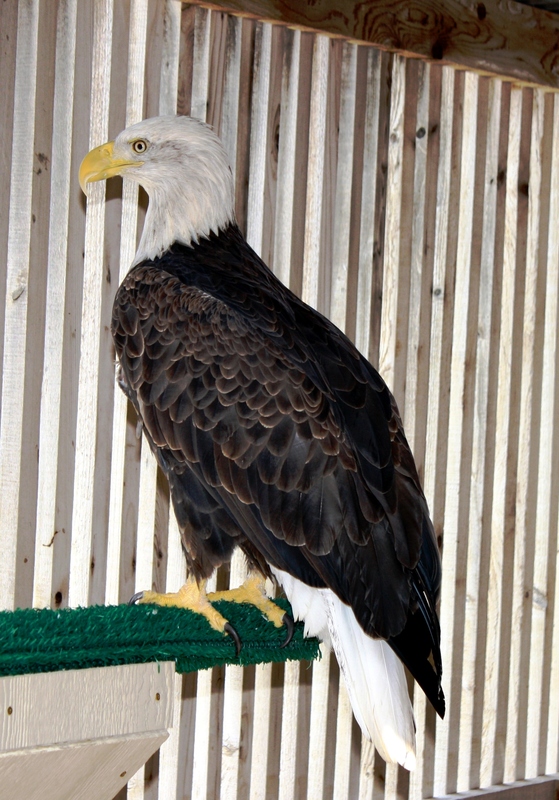 Lucky: Lucky is a mature bald eagle that came to us from Oklahoma in 2008. She was sitting under some eagle nests near Ponca City. It was found that she had broken her furcula. In rehab, she flew into a wall and broke her leg. She was going to be released, but had a small collision with Thega and did not want to fly. We took her to the vet where we found that her furcular had grown back incorrectly and even though she could pass the release tests, she could not make the migration back home. 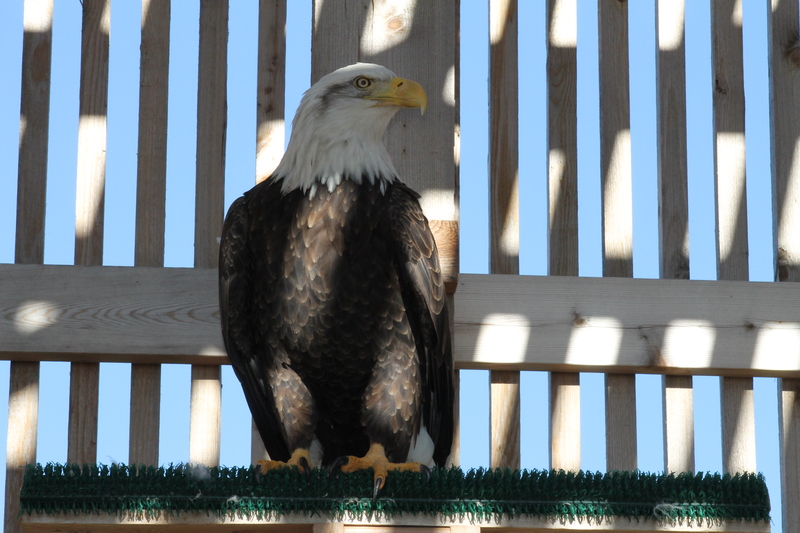 Lucky can be seen in our main flight cage. EJ: EJ is a mature bald eagle that came to us from Oklahoma in 2008. He was shot, which resulted in his ulna and radius being broken. Both of these bones were exposed to the air for too long and were not able to heal. His right wing had to be amputated from the elbow down, meaning he will never be able to fly again due to human action. He loves to talk to us anytime we walk by. EJ can be seen in our mini flight cage. 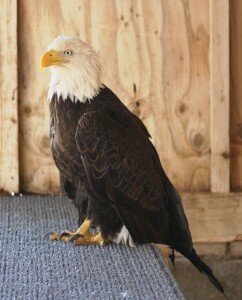 Dave: Dave is a mature bald eagle that came to us from Oklahoma in 2009. He came in with a broken wing. The break in the humerus was too close to the joint to pin which made him non-releasable. Dave is very calm and gets along with humans. 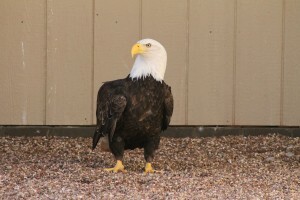 Nebraska: Nebraska is a mature bald eagle that came to us from Nebraska in 2009. She was shot with a shotgun at close range and lost part of a shoulder. We trim her primary feathers to keep the weight off so she can hold her wing up. We also built handicap ramps so that she does not have to jump to get on a perch. Nebraska can be seen in our mini flight cage. Dena: Dena is a mature bald eagle that came to us from Nebraska in 2009. She is missing the tip of one of her wings, making her unable to fly and non-releasable. We do not know how she was injured. Dena can be seen in our mini flight cage. 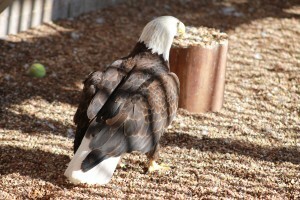 Shu: Shu is a mature bald eagle that came to us from Utah in 2009. He was shot by a hunter that was hunting waterfowl. The hunter did not want Shu to eat the waterfowl that he was trying to hunt. These injuries made Shu unable to fly and unable to be released. Shu can be seen in our main flight cage. 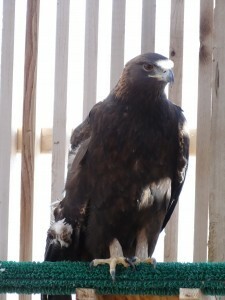 Zuma: Zuma is a mature golden eagle that came to us from Utah in 2009. He was hit by a coal truck. His injuries to his wing have taken his ability to fly and therefore he cannot be released back into the wild. He is friends with Fremont, another one of our golden eagles. 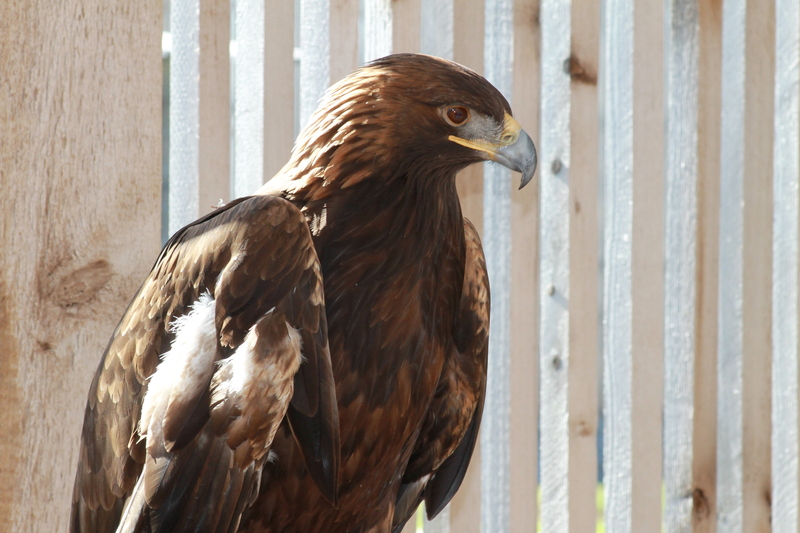 Zuma can be seen in our golden eagle flight cage. Freemont: Fremont is a mature golden eagle that came to us from Utah in 2009. He was hit by a train and part of his wing had to be amputated in order for him to survive. Because of the amputation, he is unable to fly. He is friends with Zuma, another one of our golden eagles. 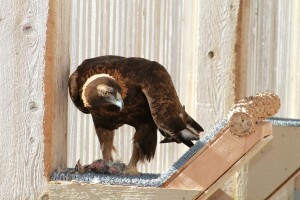 Fremont can be seen in our golden eagle flight cage. 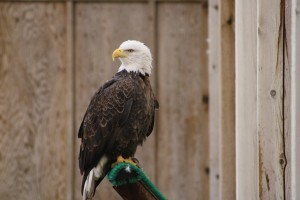 Michigan: Michigan is a mature bald eagle that came to us from Michigan in 2009. She broke a wing in an unknown accident. While it was healing, the ulna and radius fused together. She can fly short distances in the flight cage, but would not be able to fly the distances necessary to survive in the wild. Michigan can be seen in our main flight cage. Grandfather: Grandfather is a mature bald eagle that came to us from Michigan in 2009. She was illegally taken from the wild by humans that pulled her feathers out to sell. Luckily, she was found and rehabilitated. Unfortunately, some of her feather follicles were damaged due to being pulled out. Her flight feathers to not grow correctly and she has lost her ability to fly. 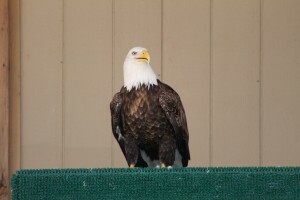 Pete: Pete is a mature bald eagle that came to us from Nebraska in 2010. 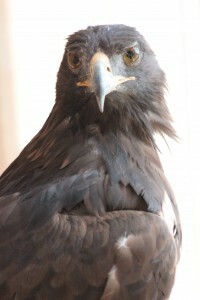 Haga: Haga is a mature golden eagle that came to us from Nebraska in 2010. He lost part of a wingtip in the wild and entered rehabilitation with a laceration and missing metacarpal bones. Because of this injury he is unable to fly. 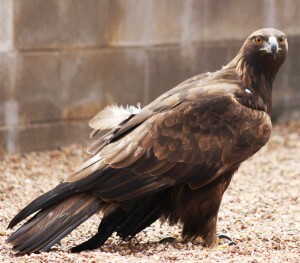 He is fairly quite compared to some of our other Golden eagles. 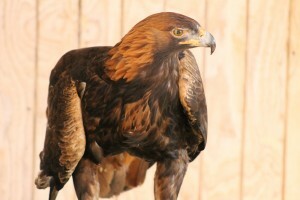 Haga can be seen in our golden eagle flight cage. 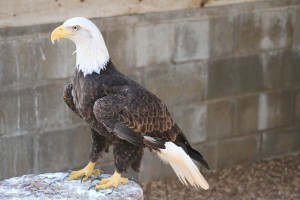 Arkansas: Arkansas is a mature bald eagle that came to us from Oklahoma in 2010. She was living on the ground and being fed by her parents when she was found. Upon examination it was found that she has abnormal feather growth. The feathers will grow in perfectly but will break off shortly after they have fully developed. 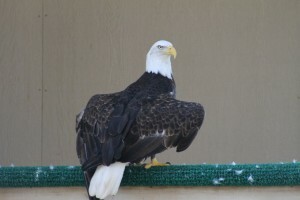 Without fully formed feathers, she cannot fly well enough to be released back into the wild. 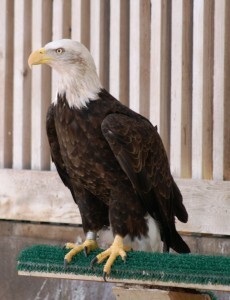 Marie: Marie is a mature bald eagle that came to us from Oregon in 2010. She was admitted to a facility in Oregon extremely dehydrated and emaciated. She is also blind in her right eye. With help from a great staff, she was able to regain her normal weight. 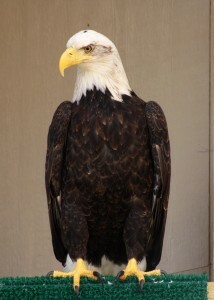 She was transferred to our facility in 2010 where she is able to fly well despite her partial blindness. 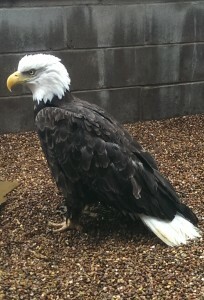 Marie can be seen in our main flight cage. 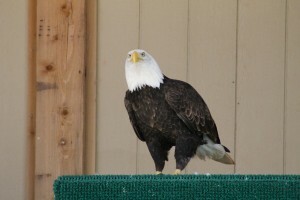 Bimi: Bimi is a mature bald eagle that came to us from Oregon in 2010. She was only a year old when she entered rehabilitation. In the wild, Bimi flew into a power line which caused her to receive burns to her left wing. These burns did not heal and resulted in part of her wing having to be amputated. Bimi enjoys life at the facility and is a dominant bird in the mini flight cage. Elisha: Elisha is a mature bald eagle that came to us from Oregon in 2010 when she was about two years old. She was admitted to rehabilitation because she was missing the tip of her right wing and had some exposed bones. 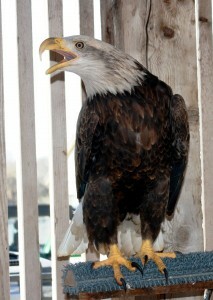 Luckily, she was handled with great care from a veterinarian who repaired the wing as much as possible. 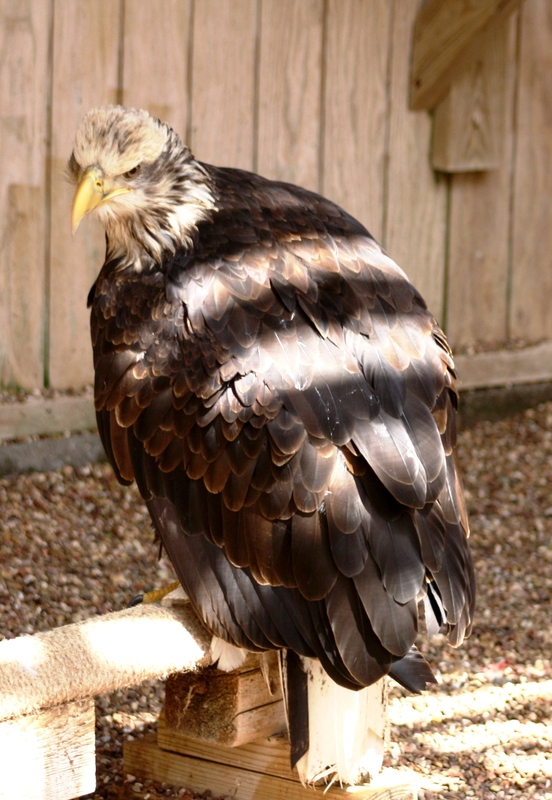 Elisha is one of the dominant birds in her cage. Daylin: Daylin is an immature golden eagle that came to us from Utah in 2010. 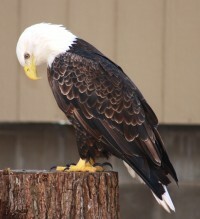 She was admitted with an injury to her right wing that affects the position of the feathers. This injury resulted in Daylin losing her ability to have normal anatomical feather alignment which affects her long-distance flight. She can be heard giving her opinion many times during the day, as she enjoys talking. Daylin can be seen in our golden eagle flight cage. 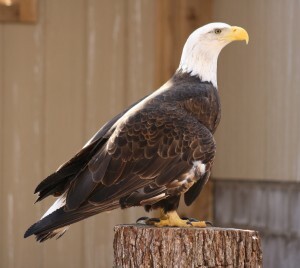 Tulsa Zoo: T-Bird is a mature bald eagle that came to us from the Tulsa Zoo in 2011. He was found in the wild with a broken humerus that did not heal properly. He has some limited flying ability and came be found flying around our main flight cage. Grace: Grace is an immature bald eagle that came to us from Nebraska in 2011. It is speculated that she was hit by a car which resulted in brain damage and loss of sight in one eye. Grace is able to preen, eat, bathe, and drink very well. She holds her head to the side sometimes as a result of her head injury. Grace is very friendly and can be seen in our mini flight cage. 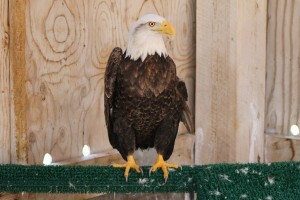 Winny: Winny is a mature bald eagle that came to us from Wisconsin in 2011. He had a fracture in his left wing that left him unable to fly very well. 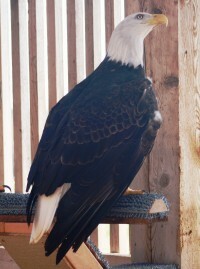 He has some flight ability and can be found in our main flight cage. 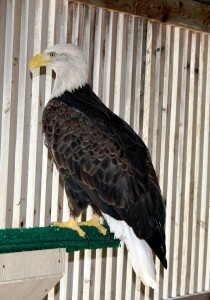 Scrapper: Scrapper is a mature bald eagle that came to us from Wisconsin in 2011. He was hit by a car and sustained neck injuries. As a result of his injuries, he holds his wings up and away from his body. Scrapper is a happy bird that likes to talk and fly around the main flight cage. Trapper: Trapper is a mature bald eagle that came to us from Wisconsin in 2011. He was found caught in a beaver trap. He lost the middle talon on his right foot as well as sustaining damage to another talon on that foot. These injuries have inhibited Trapper from successfully hunting in the wild and therefore he is non-releasable. 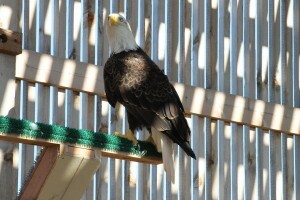 Trapper can be seen in our main flight cage. Salli: Salli is a mature bald eagle that came to us from Oklahoma in 2011. He had a broken femur that was not properly cared for before he came to our facility. Luckily, our veterinarian was able to perform surgery on his leg and now Salli can walk properly. 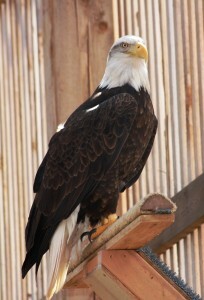 Salli can be seen in our main flight cage. 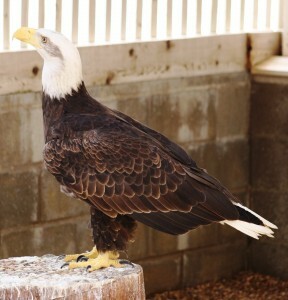 Albert: Albert is a mature bald eagle that came to us from Oklahoma in 2011. He had a broken wing that was not properly cared for before we acquired him. His wing healed incorrectly and took his ability to fly. Albert is able to get around well despite his injury. We have to watch Albert to make sure he does not steal food from his cage-mates. 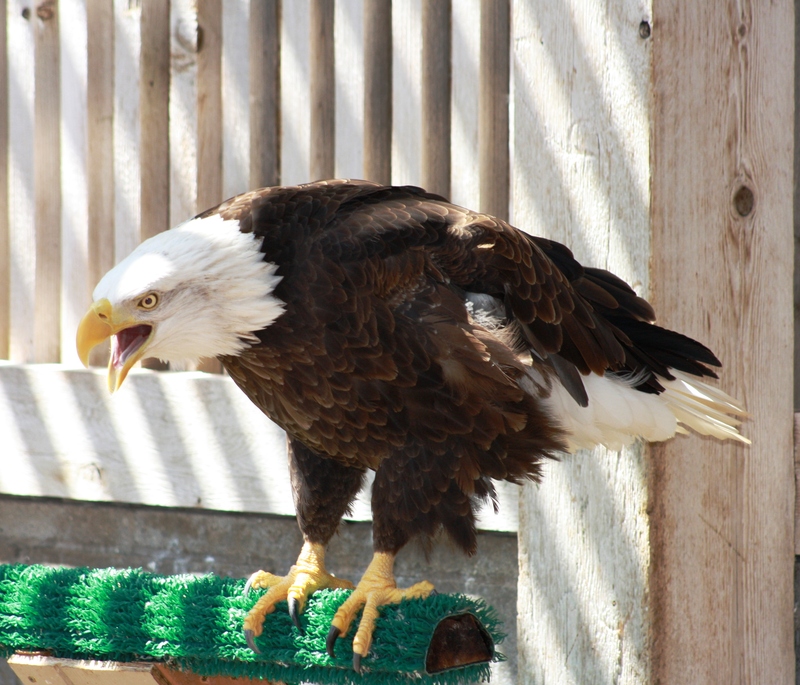 Nubby: Nubby is a mature bald eagle that came to us from Nebraska in 2011. He was admitted to rehabilitation with a broken wing. Unfortunately, his wing did not heal properly and he was constantly dragging it on the ground. A veterinarian was able to amputate part of the wing so now he can run and jump freely. Nubby can be seen in our mini flight cage. 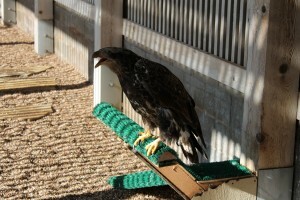 Rooney: Rooney is a mature golden eagle that came to us from Colorado in 2011. He was admitted with a broken leg and feather development issues. His feathers will grow in properly but will break off, which limits his ability to fly and makes him non-releasable. He is very talkative and can be heard chatting with other birds throughout the day. 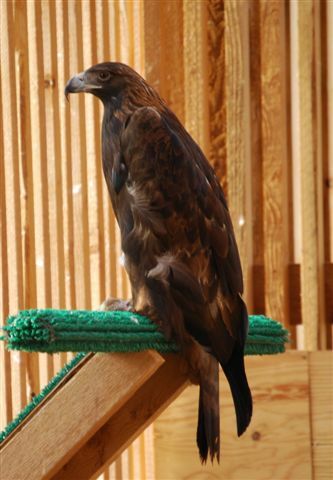 Rooney can be seen in our golden eagle flight cage. 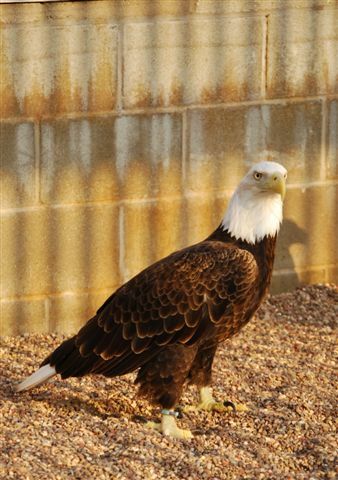 Eli: Eli is a mature bald eagle that came to us from Arkansas in 2012. She is blind in her right eye, which makes her non-releasable. We believe she was struck by a vehicle. She is named after Eli Manning because she came to our facility on Super Bowl Sunday. Eli is a very calm and quiet bird. 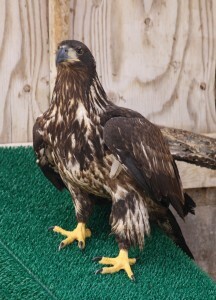 Banana: Banana is an immature bald eagle that came to our facility from Oklahoma in 2012. He entered rehabilitation as a chick with underdeveloped legs. He was malnourished and unable to walk. Our dedicated staff fed him fresh fish everyday and used a towel with leg holes cut in it to strengthen his legs. He is now able to walk, but his legs are not quite strong enough to support his weight when he lands so he cannot fly well. He loves water and chatting with visitors. Banana can be seen in our mini flight cage. 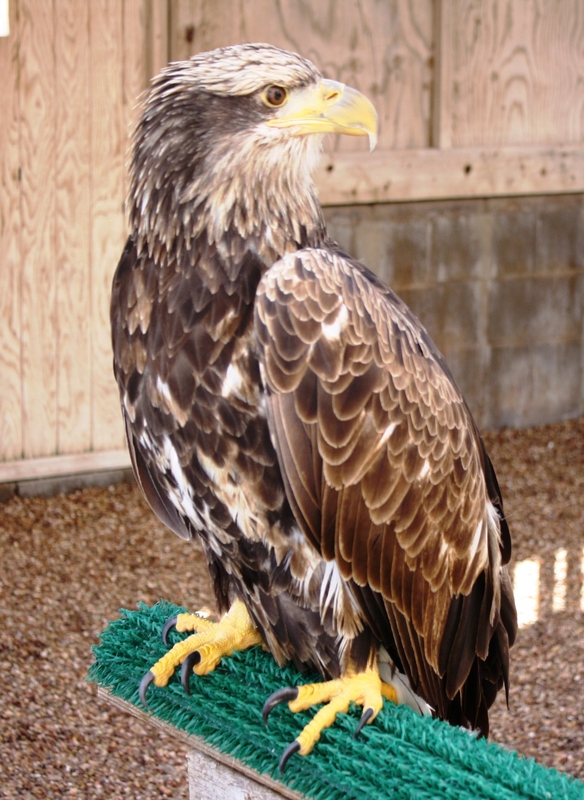 Lincoln: Lincoln is a mature golden eagle that came to us from Nebraska in 2012. She was admitted to rehabilitation with a gunshot wound to her right wing. This injury did not heal properly, making her non-releasable. She is very small and quiet compared to some of the other golden eagles at our facility. 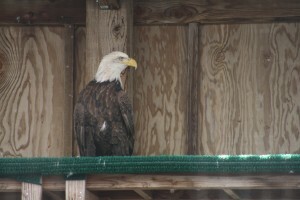 Lincoln can be seen in our golden eagle flight cage. 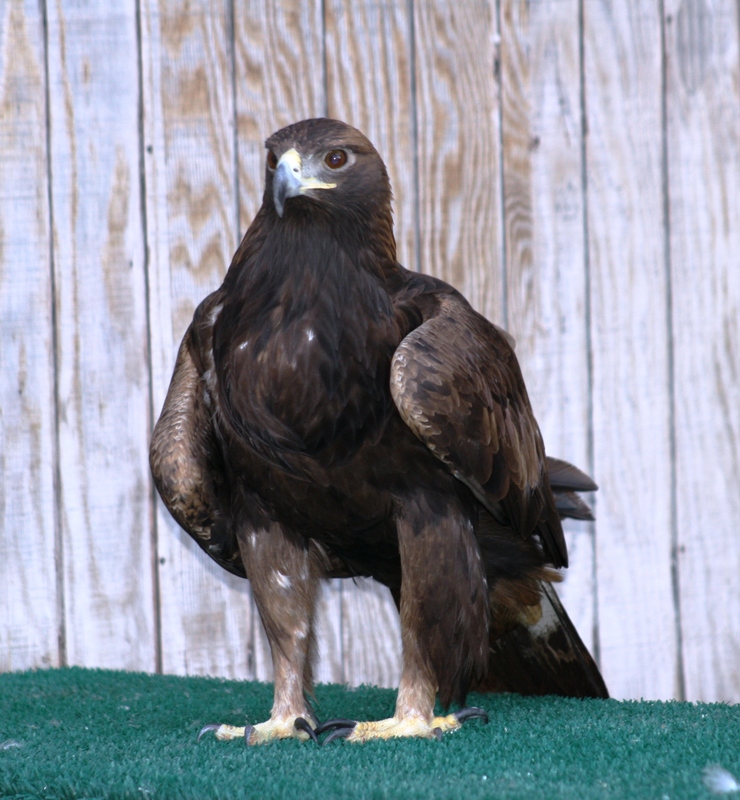 Cisco: Cisco is a mature golden eagle that came to us from Utah in 2012. He had an injury to his left elbow that left him unable to fly. 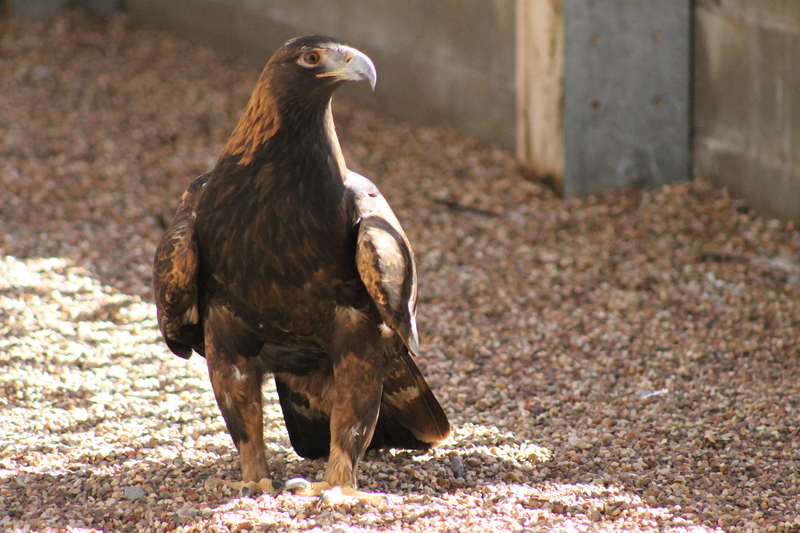 He has a unique white marking on his right shoulder called an “epaulette.” Cisco can be seen in our golden eagle flight cage. Nash: Nash is a mature Bald eagle that came to us from Oklahoma in 2013. Kaw: Kaw is a mature bald eagle that came to us from Oklahoma in 2014. She had to have the tip of her right wing amputated due to a fracture that did not heal properly. She is a very large and talkative bird. Kaw can be seen in our mini flight cage. 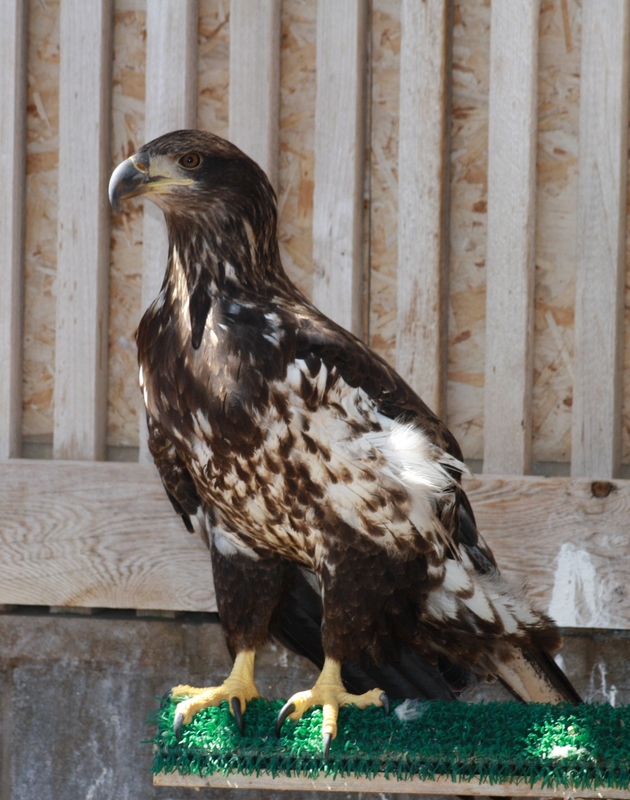 Baby Bird: Baby Bird is an immature bald eagle that came to us from Oklahoma in 2014. He entered rehabilitation with a broken left wing and severe malnutrition. Our staff took great care of him to get him to a healthy weight. Unfortunately, his wing had already begun to heal improperly and a veterinarian had to amputate it below the elbow. He is learning how to live with his amputation by watching the older birds at the facility. Baby Bird can be seen in our mini flight cage. 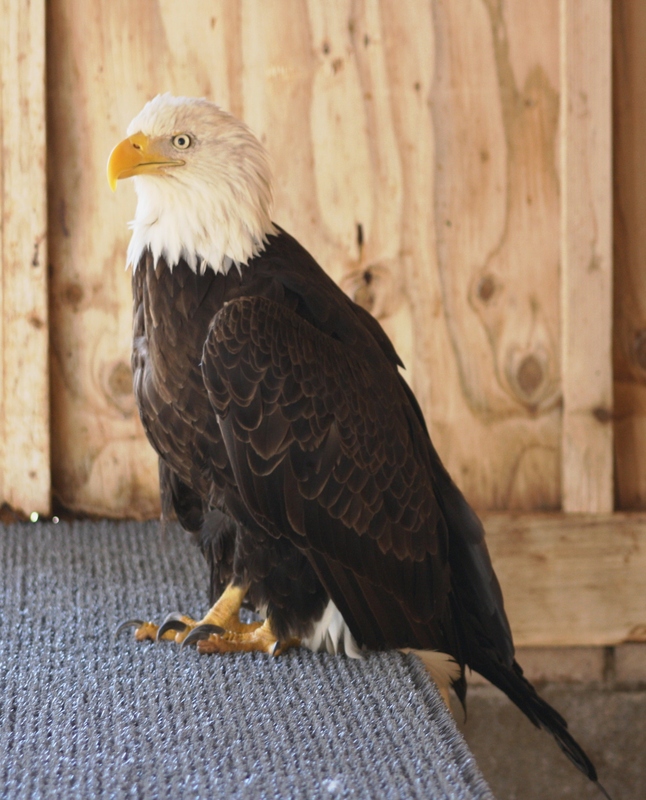 Willow: Willow is a mature bald eagle that came to us from Kentucky in 2014. She came to our facility with a dislocated right shoulder. Her shoulder healed improperly and left her unable to fly long distances. She likes to talk to staff and volunteers. Willow can be seen in our mini flight cage. 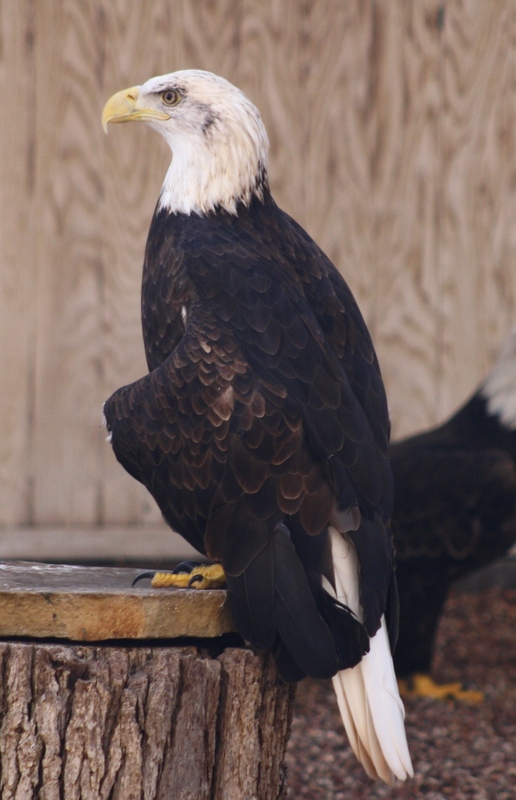 Lee: Lee is a mature bald eagle that came to us from Oklahoma in 2014 from the Pawhuska area. He was reported by good samaritans that allowed us to come onto their property to rescue him. When we pulled up he was protecting himself from wild dogs. 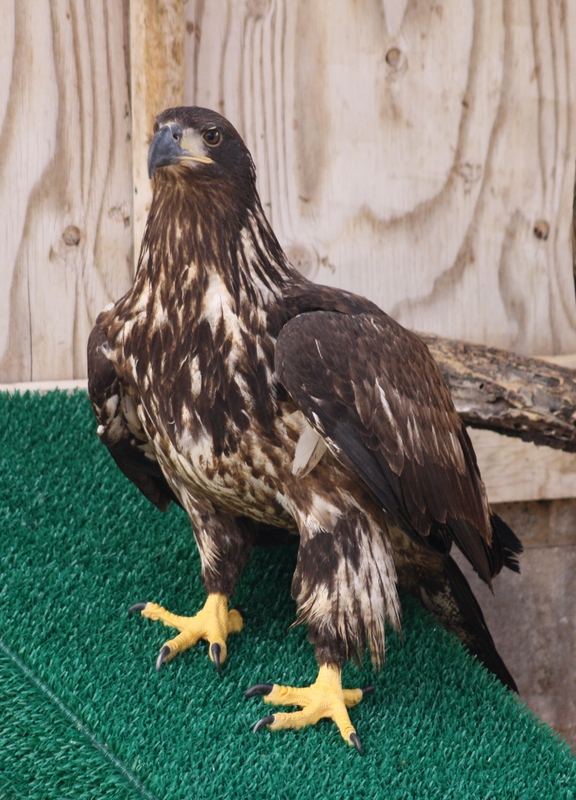 Panhandle: Panhandle is an immature bald eagle that came to us from Oklahoma in 2014. She was admitted to our facility with a broken clavicle. Because of her injury, she is unable to fly. Panhandle can be seen in our mini flight cage. 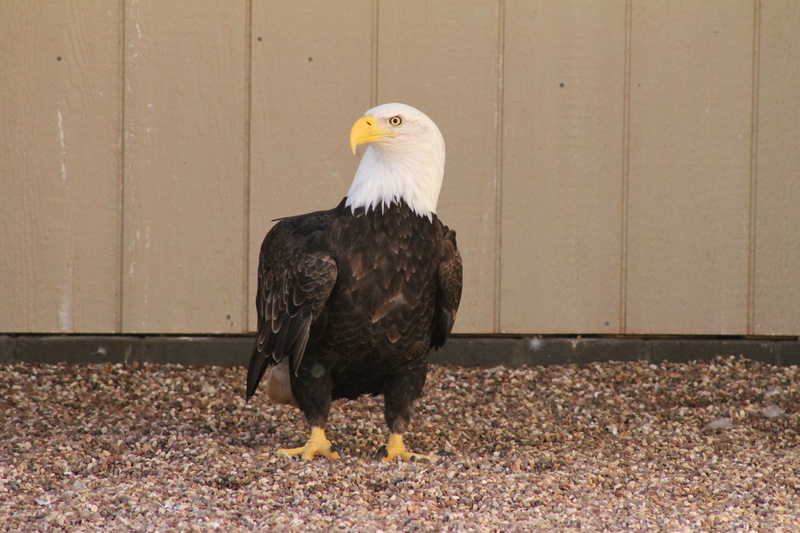 Rocky: Rocky is a mature Bald eagle that came to us from Oklahoma in 2014. He had a broken wing and a large laceration on his chest. We believe he might have been struck by a car while eating by the side of the road. His laceration healed well but his wing did not fully heal, making him unable to fly. Rocky can usually be seen sitting quietly in the corner of his cage. Pawhuska: Pawhuska is a mature bald eagle that came to us from Oklahoma in 2014. 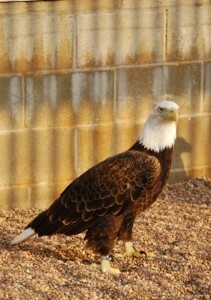 She is an older bird that is blind in her right eye, but had no other injuries upon admittance. 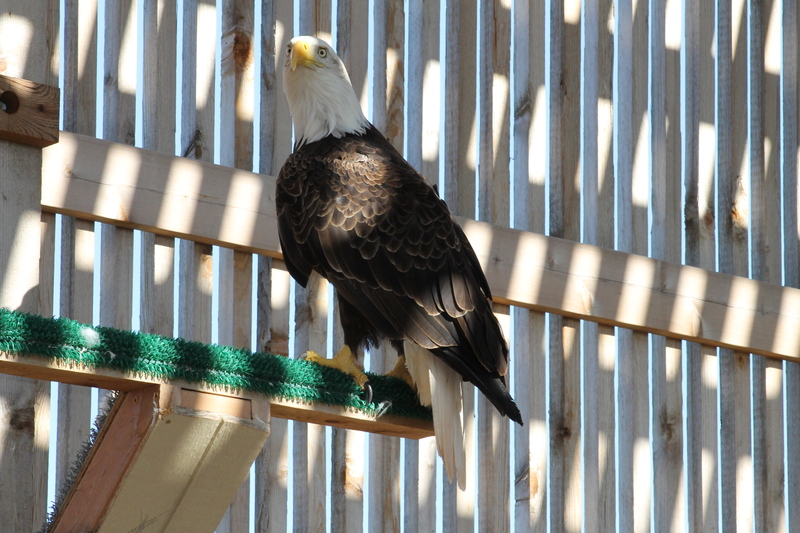 She can fly well in our rehabilitation cage, but we are unsure of how well she would be able to fly in the wild due to her partial blindness and old age. 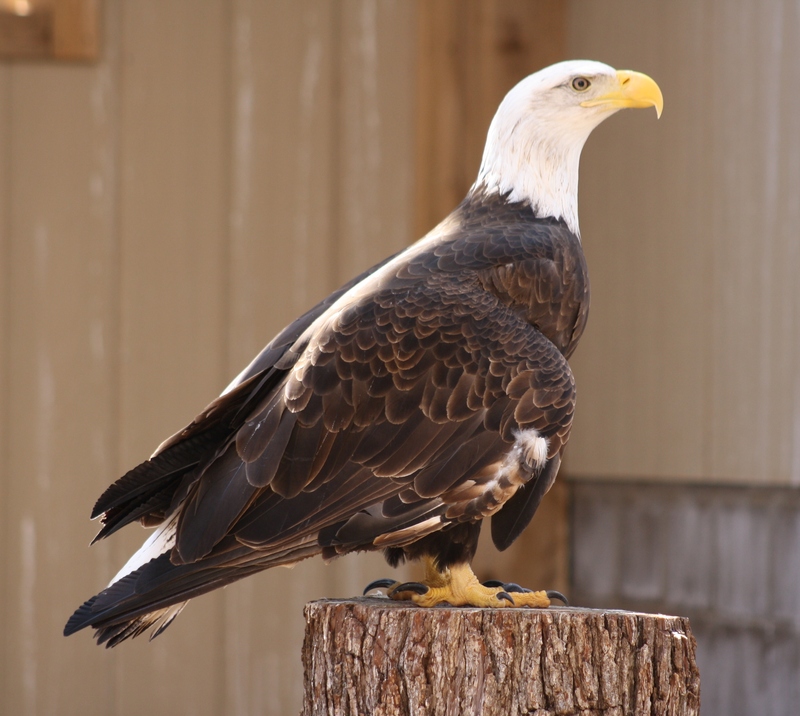 Pawhuska is very quiet and is one of our largest bald eagles. All tours are by appointment only. Please see our tour page for our hours and more information.